Families, schools and communities are celebrating in the Pacific Northwest. Whitworth and Gonzaga universities will welcome a total of 16 new Act Six Scholars to the incoming class of 2020. 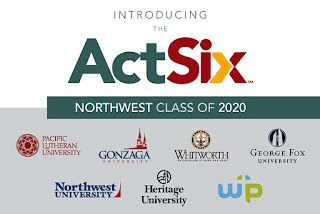 The eight scholars entering Whitworth and eight entering Gonzaga are among 56 Pacific Northwest students to receive full college scholarships as members of the latest Act Six cohort. Selected through a rigorous three-month competition among more than 700 applicants, these diverse student leaders were chosen for their distinctive leadership, academic potential, and commitment to making a difference in their communities. Recruit and select diverse multicultural cadres of the Northwest’s most promising emerging urban and community leaders. Train and prepare these groups of students in the year prior to college, equipping them to support each other, to succeed academically, and to grow as service-minded leaders and agents of transformation. Send and fund the teams together to select private, liberal arts colleges in the Northwest on four-year scholarships. Support and inspire by providing strong campus support and ongoing leadership development to nurture these young people as they find their vocations and grow into the next generation of community leaders. Launched in 2002 by the Northwest Leadership Foundation, in Tacoma, Wash., Act Six seeks to develop urban and community leaders to be agents of transformation on campus and in their home communities. Since the program’s inception, 64 cohorts of ethnically diverse and mostly first-generation, low-income Act Six scholars from Tacoma, Seattle, Portland, Spokane, and the Yakima Valley have enrolled at eight Northwest colleges and universities. Other institutions receiving Act Six Scholars this year are George Fox University, Heritage University, Northwest University, Pacific Lutheran University, and Warner Pacific College. Collectively, the awards will provide more than $9 million in financial aid over four years. To date, more than 80 percent of the 653 scholars who have started college have graduated or are still enrolled – reflecting graduation and retention rates that far exceed national averages. Several Act Six scholars have been elected as student-body presidents, and scholars have been involved in numerous other leadership roles on campus and in the community. Nearly two-thirds of Act Six alumni have brought their degrees back home to serve and lead in Northwest communities, and more than a quarter are pursuing or have earned graduate degrees. Together, these connected and educated alumni are forming a fabric of leadership that is making their communities more vibrant and just. After being chosen for the program, scholars begin an intensive seven-month training program that involves weekly meetings with Act Six staff, retreats and campus visits. Learn more about Act Six online at www.actsix.org.